The Muffin Fiend is an original opera for kids and families, the brainchild of Australian composer Diana Blom and author & illustrator Daniel Pinkwater. Adapted from his children’s book, the story follows Mozart as he tries to solve the great muffin mystery of Vienna with Inspector Le Chat. Mozart enlists the help of the audience to find out who stole all the muffins in Vienna... even the double chilli muffins! Familiar Mozartian tunes interweave themselves with Diana Blom’s contemporary score. Blush Opera want to come up with an innovative approach to children’s theatre, where instrumentalists and singers are all incoprorated into the narrative and theatrical action. Blush Opera’s unique brand of comic inventiveness aims to inspire the spirited child in every audience member - including the adults! David graduated from the Opera School of the Sydney Conservatorium in 2011, where his roles included Sam in Bernstein’s Trouble in Tahiti and Don Annibale Pistacchio in Donizetti’s Il Campanello. He has performed with a bevy of small opera companies in Sydney: Pacific Opera, Opera Bites, Itty Bitty Opera, Opera Prometheus and Rockdale Opera, to name a few. In concert, David has been a regular soloist with the Willoughby Symphony Orchestra over the past few years, and performs often as a soloist for many choirs around Sydney. In 2011 he was Papageno in a concert version of The Magic Flute for Pacific Opera; in 2012 he performed the title role in Sweeney Todd. This year, he has appeared in a program of music by Rameau with the Marais Project, and performed with Mike Patton and The Song Company in Berio’s Laborintus II, for the Sydney Festival. Passionate about new music, David was proud to perform in two workshop performances of new Australian work in 2012: Our Side of the River, by Ben Loomes and Murray Dahm, and George Palmer’s operatic adaptation of Tim Winton’s Cloudstreet. Since leaving the Conservatorium, David has become interested in education through performance. In 2012 he was Father in OzOpera’s production of Hansel and Gretel; he is currently performing the title role in Sounds Baroque’s Hercules, an adaptation of Lully’s Alceste, which is being toured around the state by Musica Viva In Schools. David is also excited to be part of the WotOpera program, in which high schools students conceive, create, write, design, rehearse, produce and perform their own opera over four school days. David sings regularly with Cantillation, and was in the ensemble for the 2012 Pinchgut Opera production, Castor and Pollux. 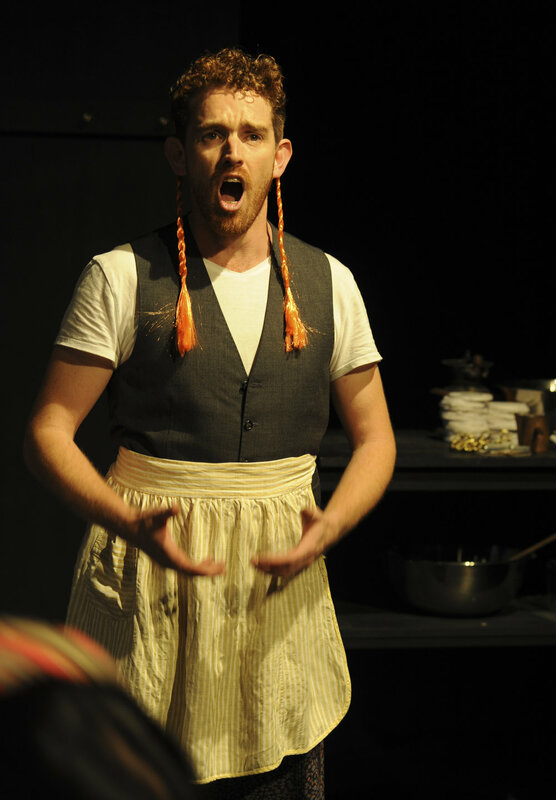 David appeared as Mr Tomaso, the Master Chimney Sweep, in The Chimneysweep in 2014 for Pinchgut. Jermaine is a founding member of Blush Opera and a current Co-Artistic Director. As part of Blush Opera’s commitment to presenting original works by new composers, she has performed Paul Smith composition ‘Fancy Me Dead’ at The Hayes Theatre as part of the New Music Network Mini Series. in 2017 Jermaine is loving having the role of Kitty written for her in Blush Opera's latest creation Chop Chef: The Opera by Smith & Koh. Jermaine recently trained at the IFAC New Zealand Singing School 2017 where she worked with international coaches. A graduate of the Lisa Gasteen National Opera Summer School in Brisbane (2014), she studied opera at the Sydney Conservatorium of Music (2013-2014) where she took on the role as a sassy aunt Fidalma in Cimarosa’s comic opera Il Segreto Matrimonio. She took the lead role in Menotti’s Old Maid and the Thief and has performed as Cecilia in Mark Adamo’s Little Women. 2016 was thrilling year as Jermaine made her debut at the Willoughby Symphony Orchestra Gala; performed as Lady Bertram in Operantics’ production of Jonathan Dove’s Mansfield Park and will again join Operantics and the Penrith Symphony Orchestra in their production of La Sonnambula as Teresa. She revelled in the gluttonous role of Suor Dolcina in Opera Projects Sydney’s Suor Angelica; La Frugola in Puccini's Il Tabarro with Constantine Costi & Luke Spicer and in November, Jermaine was part of the cast of Opera Australia’s The Eighth Wonder in the role of Madame Magda performing on the forecourt of the Sydney Opera House. In 2017 she performed in Carmen as part of Opera Australia's production on Sydney Harbour. Taryn studied at The University of Auckland School of Music, where she graduated with a Bachelor of Music majoring in Voice in 2008. Her other musicianship skills include attaining AmusA in piano and being accepted into the piano programme at the Aspen Music Festival and Summer school, USA. Currently based in Sydney, Taryn has recently performed as a soloist in the Willoughby Symphony Grand Opera Gala and was a recipient of the Q Lab Artists in Residence Programme at the Joan Sutherland Performing Arts Centre. In 2015 Taryn performed the role of Musetta in La Boheme with the Western Sydney Opera Company, Michaela in Carmen with Symphony Central Coast, Marie Antoinette for Blush Opera’s production Ladies Who Brunch in the Adelaide Fringe Festival and the role of Cora in the world premiere and subsequent tour of Fancy Me Dead by Australian composer Dr Paul Smith. Taryn has often performed with Sirius Chamber Ensemble, most notably the Alan Holley song cycle Borneo Songs and Berg’s Sieben Fruhe Lieder . Taryn was a Young Artist with Pacific Opera in both 2011 and 2012 during which she performed the role of Bettina in The Deluded Bridegroom and also Second Spirit in Mozart’s The Magic Flute. As a Pacific Opera Young Artist she also performed as a soloist in the Pacific Opera Gala, Opera By The Lake, Opera Unlaced and covered all three roles in the premiere of new Australian work Golden Summers by James Long. Taryn has had the privilege of premiering many new works. A highlight was performing and recording a new Soprano song cycle by Dr Paul Smith and singing in Art/Opera collaboration Project Rise; Singing The Virtual (Dr Andrew Burrell/Dr Paul Smith). Daniel Pinkwater is a prolific and popular author and illustrator who is celebrated as a particularly original, imaginative, and versatile contributor to literature for children and young adults. Renowned as a humorist and satirist, Pinkwater creates unusual books that characteristically point out the absurdity of reality, especially as related to contemporary society, while presenting young readers with both solid morals and plenty of laughs. The author is well known for his irreverent—some say anarchic—sensibility as well as for the droll wit he uses to skewer his targets. Often parodying genre fiction such as the detective story, the horror story, the adventure tale, and the science-fiction and young adult "problem" novel, Pinkwater typically features ordinary characters—often boys from Rochester, New York and Hoboken, New Jersey—who are placed in incredible, improbable situations. Their fantastic, often frenetic adventures lead these boys and girls to meet an array of odd creatures, both human and otherwise. Diana Blom (composer/pianist) was born in New Zealand and moved to Sydney in 1969. She has studied music at the University of Canterbury (NZ), the University of Sydney (PhD on minimal music in an educational context) and the University of Michigan (musicology). Composition studies have been with Peter Sculthorpe and Ian Farr. Blom has an interest in Australian writers and has set to music words of David Malouf, Helen Garner, Robyn Ravlich, Tim Malfroy and Peter Goldsworthy. In 1974 she was Composer–in–Residence with the Australian Opera who commissioned her to write a children's opera. Several music theatre works written for children have been performed in schools in Australia and Hong Kong. In the School of Communication Arts, University of Western Sydney, Blom is Associate Professor of Music. Paul Smith has recently completed a Doctorate of Creative Arts at the University of Western Sydney where his research has focused on musical composition and visual media. His Kawaii Suite for piano (2010) and Iceberg Variations for Toy Piano (2013) have been recorded and released under the Wirripang label by Italian pianist Antonietta Loffreddo. in their recent showcase of Australian compositions and a song for tenor, piano and violin for singer Lorenzo Rositano. His recent string quartet work, Broken Reflection 1 & 2, was recorded by the Acacia Quarter in 2013. Paul has also produced an operatic fundraiser for group Australian Marriage Equality twice over the past two years called Swopera, supported by Emma Ayres, Alex Greenwich MP and the Hon. Michael Kirby. Two new works were written in honour of the events and premiered by Taryn Srhoj and members of the Sirius Ensemble. Paul Smith has been commissioned to write chamber work “The Spider- maiden and the Runaway Plum Blossom for Singapore based ensemble Chamber Sounds. He has also recently completed creative development of Frankenstein with Q Theatre to be premiered in November at the Joan Sutherland Performing Arts Centre. Paul is currently composing a new work in development - Chop Chef: The Opera - with librettist Julie Koh for the The Joan Sutherland Performing Arts Centre Southlands Breakthrough Award 2017. The Q Theatre Blush Opera was awarded the Q Lab Residency for 2016 which support four independent artists or groups of artists in the development of a new experimental project.